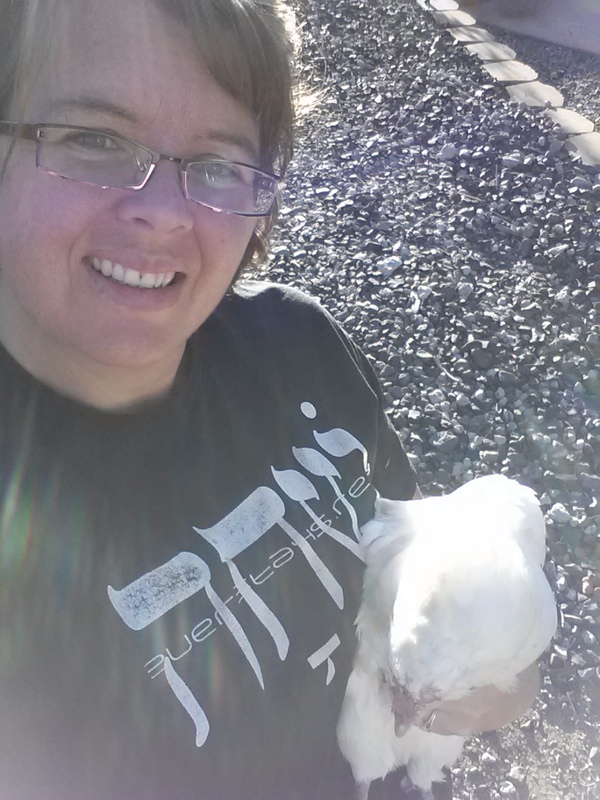 If you follow us on facebook, you might have seen a comment about our chickens. Yep, we have chickens again! Actually, we have one of our old chickens back. When we moved up to Castle Rock, we gave our chickens to my parents since we were not prepared to have them on the homestead yet. The deal was that since they lived just a few miles away, they would still be partially our chickens, we still got eggs, Princess Girl cleaned the coop, and we’d care for them when Mom and Pops were out of town (which is often). And then we moved to Portland, OR unexpectedly. And mom found another home for the chickens since they travel so much. When Princess Girl heard that her pet chicken, Scaredy, had been given away, she was very distraught. So, my mom called up the lady to whom she had given the chickens and asked for Scaredy back. The lady was very obliging, and when the girls and I were in Nevada recently, we picked up Scaredy and brought her back to Mom’s house. But you can’t have just one chicken. There’s some law against it, right? I mean, they are social creatures. It was just sad to see her all alone in the run. So, we found another hen on Craigslist. The owner assured me that she’s only 3 years old and is still laying, but we have yet to get an egg out of her. But, hey, she was cheap and is providing good company for Scaredy. She is a White Leghorn and of course Princess Girl named her Snow (and Flower Girl calls her “No-man” 🙂 ). After a very brief period of deciding who rules the roost, they are now devoted sisters. So much so that on the 13 hour drive home, there wasn’t a single squable out of them. So anyway, I brought two chickens back from Nevada with me. And we had no place to put them. We had discused the possibility of chickens with the in-laws, but it was still hypothetical. Until suddenly it wasn’t. Well, we found a box they could roost and nest in and they ran about in the back yard for a few days as we decided the best place to put them. 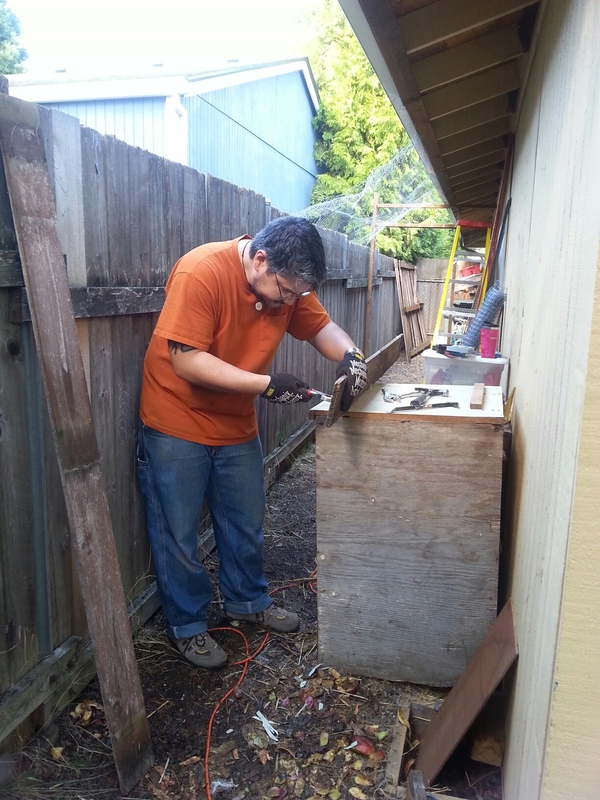 What better use of a small (and I mean tiny) unused side yard than as a chicken run? 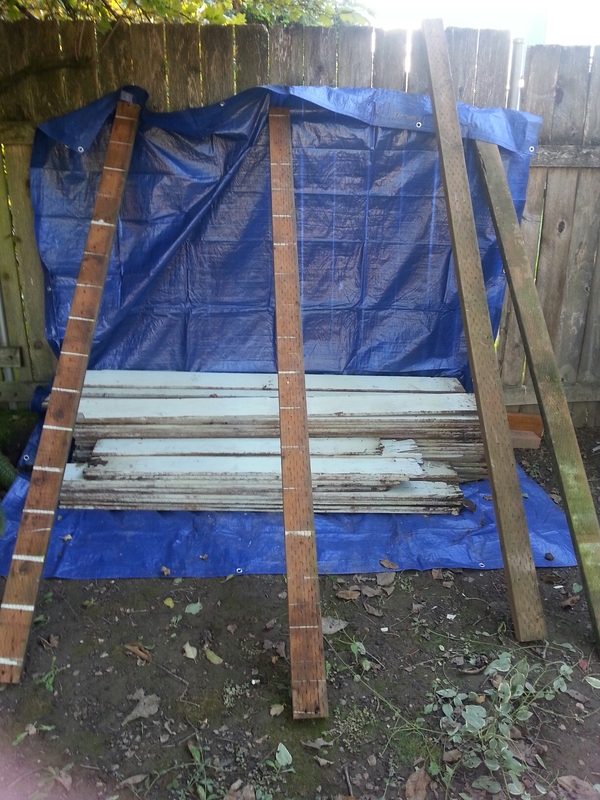 I found some free wood in the form of fence panels on Freecycle. We decided to use that wood to build the chicken run. 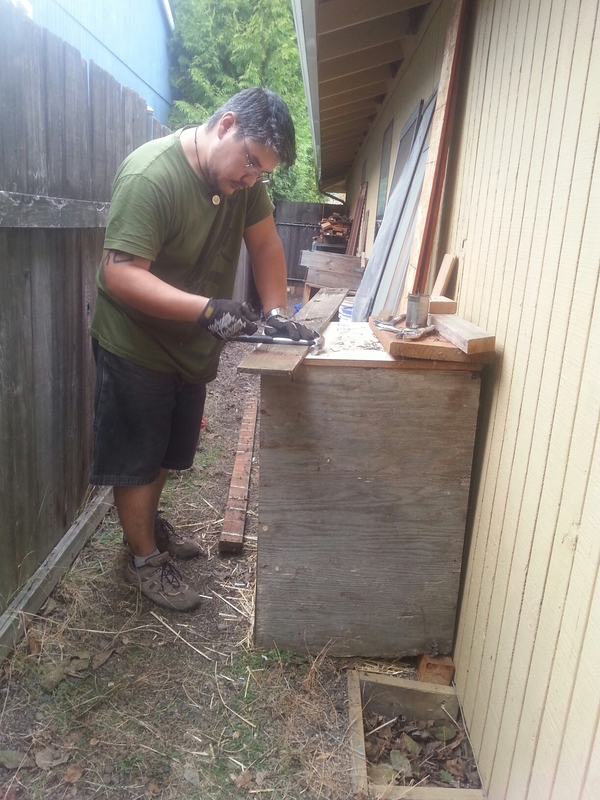 With a little bit of work, we had a pile of wood to use for various projects. We got some half rolls of chicken wire given to us (my parents are amazing like that!) and we used that and the fence wood to put up the supports to enclose the run. The Princess even put a few staples in. And yes, I realized after taking the pictures that she didn’t have on proper safety gear. We put up the tarp because…well…because we live in the Pacific Northwest and don’t want our chickens cold and wet ALL the time! The tarp gives their run a dry area which they can hang out in. We got one door (which we built out of fence wood and chicken wire) put on this evening but still need to hang the other (which was a screen door for a sliding glass door). We’re pretty proud of the fact that other than the nails and staples, we didn’t have to buy anything for the run. Tomorrow I finish closing up a few more holes with chicken wire, then we need to build them a proper roost. Right now, we just have one box which they roost and nest in. Not ideal. At any rate, that’s our current goings-on. I’ll try to post some more pictures of the run and coop as we finish it. 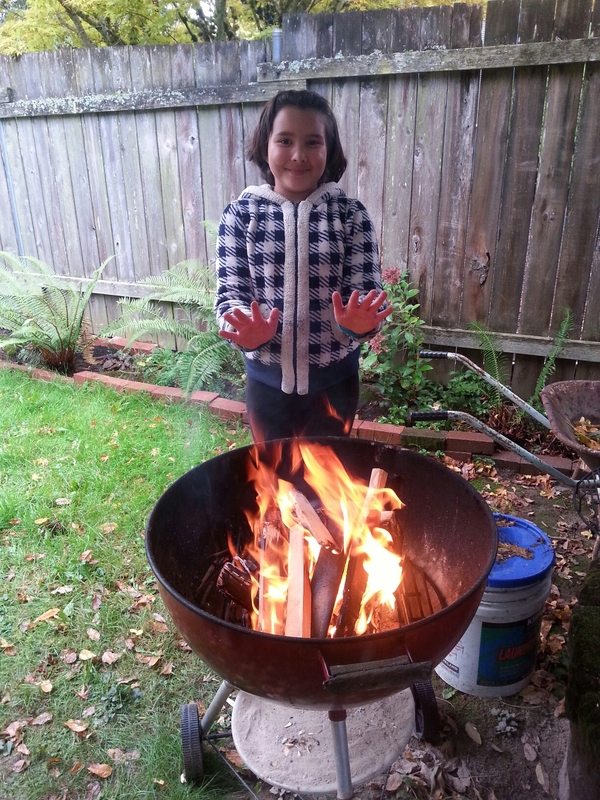 Oh, and here’s a picture of The Princess and her latest fire she and her daddy made using a magnesium rod fire starter. They report that those things are hard to use! Part of Princess’ schooling is taught by her daddy and is all about outdoor skills. Sure, we may live on a tiny lot in the middle of suburbia, but eventually we’ll be back on the homestead and she will need those skills then, if not before. Besides, they are just good, basic skills to have. What skills do you think every kid should learn as they grow up? 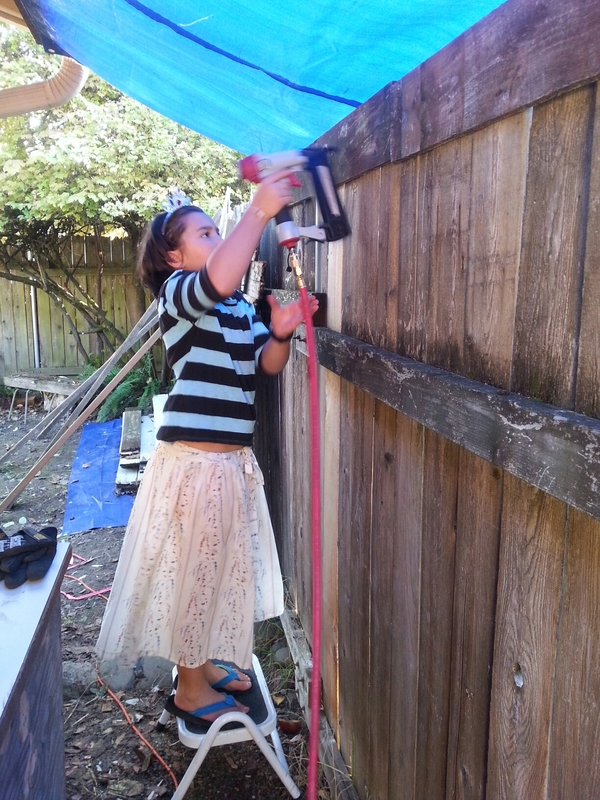 This entry was posted in Portland Interlude 2014-2016, Urban Farming and tagged Chickens, Homeschool, Homestead Kids, Reduce, Reuse, Recycle on October 19, 2014 by Maridy.